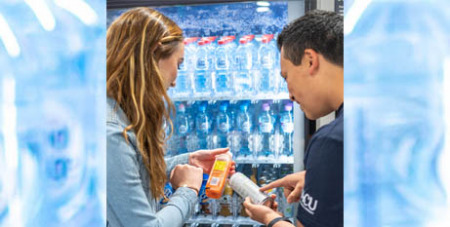 Australian Catholic University is the first Australian university to remove sugary drinks from its vending machines. It’s hoped the move will encourage other universities, schools and workplaces to follow suit. Anne Cummins, Deputy Vice-Chancellor (Students Learning and Teaching) at ACU, said the university had a duty to ensure its students and staff had a healthy environment in which to study and work. “We wanted to change the perception of what products are automatically expected to be sold in vending machines. ACU regularly reviews not just the goods and services we provide, but also the providers and supply chains we use. This is part of the university's commitment to a sustainable and healthy environment in which to study and work,” Professor Cummins said. The vending machines now have to follow the 75/25 rule, where 75 per cent of products are ‘everyday’ (healthier) food and drinks such as water, coconut water and diet soft drinks, and limit 25 per cent of the products to ‘occasional’ items, such as some fruit juices, and flavoured milks. Jason Wu of The George Institute for Global Health, who managed the analysis with ACU, said: “This is a first step but there are many more to go. We know when people are presented with healthier choices they choose them. "When drinks such as these have been removed from sale in universities overseas, people have not complained or demanded their reinstatement. They simply swap for a drink not loaded with sugar,” Dr Wu said.